San Antonio Spurs small forward Kawhi Leonard (2) smiles during a timeout against the Orlando Magic at AT&T Center. Up until mid-June, a Kawhi Leonard trade seemed possible but unlikely from San Antonio's end. Based on all the public information we'd been privy to, the Spurs were prepared to heal the relationship between the organization and their disgruntled star and still offered the most potential money in the form of a "supermax" deal, which will not be available to him elsewhere. But things got very real on Friday afternoon, with agents leaking reports coming out of San Antonio that Leonard has officially demanded an exit from the only NBA team he has ever played for. In the span of seconds, national reporters from several outlets shared that Leonard is looking to move on. Kawhi Leonard wants out from the San Antonio Spurs, league sources tell Yahoo. From there, Adrian Wojnarowski got a lot more specific, honing in on one destination in particular: the Los Angeles Lakers. This report would get walked back a little bit shortly afterward, but the message had already come through loud and clear. Without an actual no-trade clause, Leonard is trying to posture as if he has one in order to get to the city and/or the team he wants to play for moving forward. Once that sort of information is in the public space, it ends the conversation among a lot of fans of opposing teams. Why would you give up anything of value for someone who has a clear preference to play somewhere else, and could leave you for nothing in a year. That's a perfectly reasonable line of thinking, and if the Sixers end up standing pat on the trade front no one should get too angry about it. However, you can make just as strong a case that the Sixers are in perfect position to take this specific risk. And I would argue trading for Leonard right now, assuming you're not paying through the teeth for him, should become the organization's No. 1 priority heading into the draft and free agency. The Sixers have a wonderful case to present to free agents this summer. They have a coach who is beloved by his players and runs a modern system, a franchise center fresh off an All-NBA appearance, an unselfish rookie with crazy all-around skills, and talented role players around them. With the right addition, they will be right there with the league's elite. Sixers prospect preview: Does Zhaire Smith have enough skills to compliment his raw ability? Sixers prospect preview: Can Lonnie Walker refine his handle enough to be a star? Even still, you're still asking a big-time free agent or other players around the league to make a lot of assumptions when joining up with that group. Fair or not, the Sixers are still viewed like kids to some extent, and given the very obvious struggles Ben Simmons had in the round two series with Boston, veteran stars might feel this is a steeper hill to climb than those close to the situation believe. That conversation is a lot different if you have a Leonard-level player on the roster. What's more, you don't have to go through the charade of trying to convince him you have a project worth seeing through to get him to come here. The only thing that matters is putting together the best possible package to entice San Antonio into sending Leonard your way. With Leonard in the fold, you can then go to other teams and point to a Finals MVP, elite two-way player, and a battle-tested veteran as the best player on your team and say, "That's who you come here to play with." His salary would complicate bringing in other big free agents, certainly, but generally teams and players will find a way to make it work around the margins if it means adding another star to the roster. What's more, you don't necessarily need another star at that point. When healthy, Leonard is a top-five player and one of the few guys who can change the game on both ends of the floor. He can dominate a game with or without the ball in his hands, offer offensive versatility the Sixers don't have, and take on assignments up and down the lineup. Alongside Simmons and Embiid, that's a team that would be a no-doubt contender, assuming health. And yes, it would obviously be better to go out and get a free agent that costs you nothing except for the cap space you'd use to sign them. But there's always the possibility you come away with nothing in that scenario, and then the Sixers return the same flawed team that couldn't get past a depleted Celtics squad this spring. For my money, the Lakers represent the biggest free agency threat to the Sixers and the players they are ostensibly after this summer. LeBron James' decision specifically has been noted to be about things bigger than basketball, and with a home in that city already there's already plenty of smoke to suggest they're a leading contender for his services. But there's an important subtext here — LeBron is almost certainly not going to L.A. without more immediate help. He has never shown much of a willingness to sit and wait for young talent to develop, as evidenced by Cleveland's trade of Andrew Wiggins and other assets for former Wolves star Kevin Love. The assumption has always been that he would try to assemble a cast of veteran stars in order to seriously consider the Lakers. If the Sixers — or any other team for that matter — decided to pull the trigger on a Leonard trade this offseason, it would all but guarantee he could not join the Lakers long-term, assuming James heads there. How is that? Well, circle back to the immediate help for LeBron point. Without a Paul George type at the very least, LeBron isn't leaving for Los Angeles this summer, barring L.A. pulling off another unlikely trade on top of those acquisitions. There's just not enough there for a player under more pressure to win than any player in the league, and arguably any player in modern league history. Acquiring George and James, as one example, would represent a giant chunk of L.A.'s salary cap and limit their options moving forward. Unless Leonard suddenly felt compelled to take a deal far under his market value — and I'm talking not even close — there's then no realistic scenario in which he goes to L.A. as a free agent in 2019. You are essentially removing one of the NBA's top destinations from the Leonard flowchart, which is no small thing for a team in search of their own final piece. On top of that, you get the added benefit of getting Leonard into your program for a year, allowing you to pitch/convince him of the upside first-hand, rather than sitting in a board room or having him watch your team from afar. Could you still end up losing him to another team? Sure. But all the biggest suitors would come with red flags or limitations. The Celtics, as one example, already have $104 million committed for the 2019-20 season, and are much better positioned to acquire stars through trade than they are free agency. Leonard's priorities can be called into question given the way this Spurs situation has unfolded, but you would have to assume he'll be hunting for a good team with upside in a big market. There are only a handful of those out there, and should the Sixers make a move for him, they are artificially narrowing down his options and helping their case to keep him beyond 2018-18. You don't want to overstate the impact of Friday's reports on Leonard's broader trade value. Teams have obviously known about discontent for some time now, and other franchises reportedly made preliminary offers for his services this past season. Still, when a player actively says he wants out by sending the message through reporters at the national level, his value on the open market isn't going to go up. 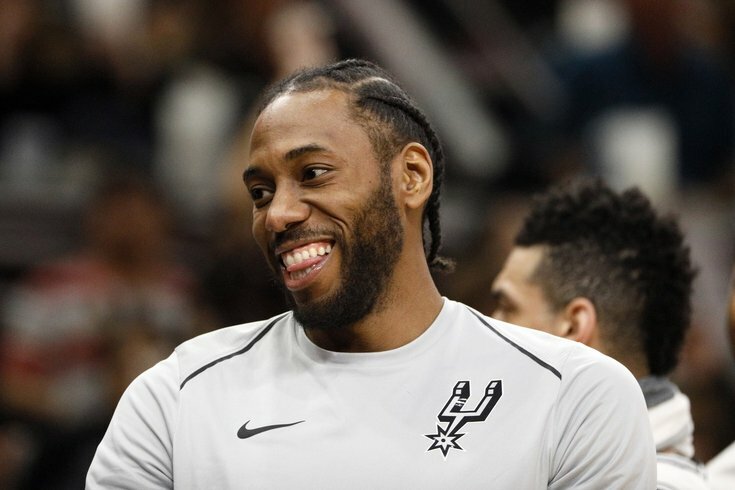 Teams were already going to be relatively skittish after a lost season and ongoing health issues for Leonard, and now they can go to the Spurs and say, "This guy doesn't want to play for you." The value of stars on the open market is almost always overstated in preliminary discussions because they only become available in the first place due to things like the threat of leaving in free agency. San Antonio already had that looming over the franchise before this meltdown, and now this takes things to another level. Yes, this adds more urgency to the scenario and thus could prompt suitors like the Lakers or Celtics to offer more than they might have otherwise, cognizant of the fact that this is an open race now. Still, this is unique opportunity to go out and get a star who fits right into how you play, immediately makes you better, and is young enough that his prime is still in front of him. Of course, it would be nice if the Sixers had an actual GM for a time like this! With all due respect to Brett Brown, he has never had to juggle this much responsibility at once, and though his connection to the Spurs will be invaluable in getting intel here, it's also a lot to ask of the head coach/interim GM to execute a trade that will have ramifications for the franchise for the foreseeable future. But Leonard is so good that he demands the organization's attention, even with so much going on around them. Provided the intel they get is good and that they don't sell the farm to chase him, seeing what it will take to acquire Leonard is a no-brainer.